With its nifty paperback-original title, “Death Benefit” starts out as a fun little romp, an old-school Person Of Interest episode with a simple set-up and a lot of crisp, funny dialogue. After a brief overture in which Reese and Shaw help out a couple of drug dealers by cold-cocking them out before they can betray and murder each other, Root arrives to whisk Shaw off for some off-screen adventures together in Miami. This serves two purposes. 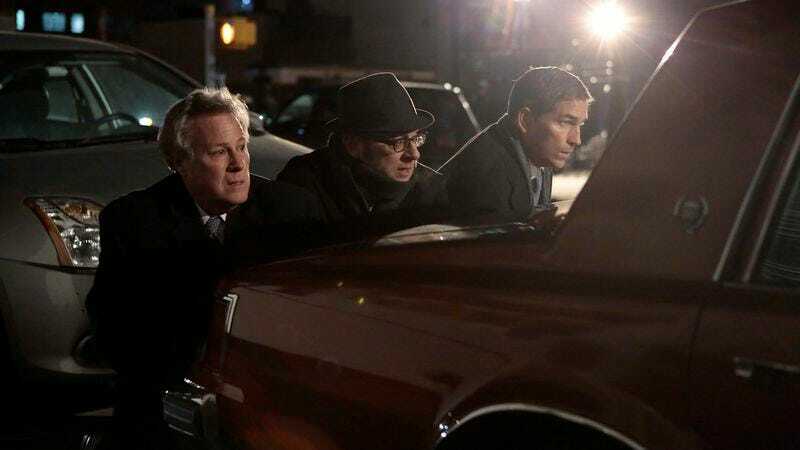 First, it provides an early Christmas present for anyone in the viewing audience who writes Person Of Interest fan fiction, and second, it leaves Reese to carry the load for much of the episode. This could be an early Christmas bonus for Jim Caviezel. 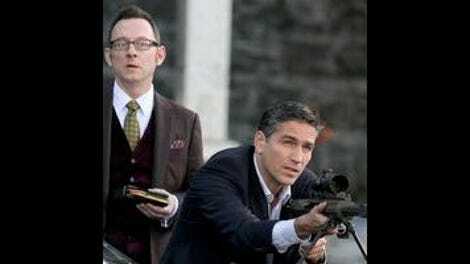 Remember when this used to be Caviezel’s show—at least, the parts of it that didn’t involve Michael Emerson sitting in a room, reading from a computer screen, and occasionally taking breaks to go hang out on a park bench and look troubled? Caviezel has hung in there, making room for more people at the show’s center and often receding into the background so that his co-stars have had room and time to make their presence felt. He’s is very good at pulling back and seeming to disappear, even when close examination reveals that he’s right there on the screen. He’s actually better at it than anyone who’s played both Jesus and the Count of Monte Cristo has any right to be, indicating that he doesn’t suffer from the kind of ego problems that could make someone like McLean Stevenson imagine that the sirens of Hollywood were calling him to do bigger things than bask in Alan Alda’s shadow. The Congressman, played by John Heard, is a popular and outspoken critic of government surveillance. He is also, as Finch explains, an all-important vote on the House Rules Committee, which “controls the flow of legislation, spurring it forward, or stopping it altogether.” (Person Of Interest: Providing paranoid thrills and basic civics lessons since 2011.) It seems a safe bet that Congressman Heard has been targeted by Decima, which doesn’t need some busybody with outdated notions about individual privacy getting in the way of its lucrative government contracts. As if to confirm this, the monstrous Greer is seen taking a meeting with the Senator played by John Doman at an art museum, standing in front of Bosch’s The Garden Of Earthly Delights. It’s a funny image, because they both look as if they might be characters in the painting who just stepped out for a smoke. The sting in the episode’s tail comes when Reese and Finch realize that Heard isn’t a potential threat to Decima at all: He’s snugly in the corporation’s pocket. Heard, it turns out, is an opponent of government surveillance not because he believes individual privacy, but because, like any upstanding American blowhard, he doesn’t believe in government. He’s a capitalist, or to be more precise, a profiteer, and he’s prepared to sell his vote to the highest bidder to make sure that Samaritan has complete and total watch over us all—provided that it does so as an extension of the free enterprise system. He scoffs at the idea that this will continue to be a problem for his supporters, once they’ve worn themselves out yelling. “The simple truth is,” he tells Finch, “people want to be protected. They just don’t want to know how.” Finch looks deeply disturbed to hear this line, probably because he himself said it to Reese back in the series’ first episode. The arrival of a strike force cuts the debate short before it’s been settled. The episode ends with its heroes broken into pieces and on the run, with Reese and Shaw trying to evade capture and Finch wandering over to gaze into a security camera on the Avenue of the Americas—an image that the show uses, not for the first time and probably not for the last time, to suggest that the global surveillance network that is supposed to tie the entire world together into one safe, international suburb is actually isolating us into targets, to be picked off that much more easily. No doubt when the smoke of whatever is coming has cleared, someone will still be alive and in shape to carry the show into its fourth season. But just in case, it’s getting to the point where it would be reassuring to know that Finch has a contingency plan to make sure that someone will go to the library when he’s gone and feed the dog.